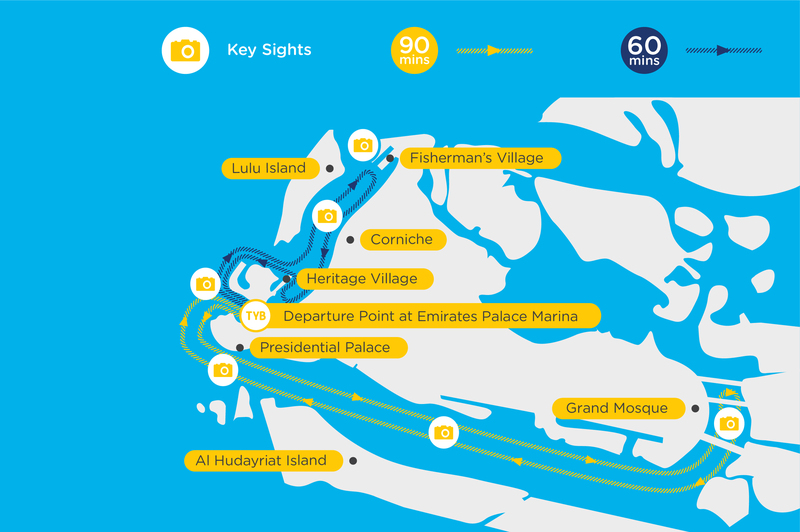 Get on the yellow rubber boats and discover Abu Dhabi from the water. There is simply no better way to explore the beautiful skyline. Start the tour in style at the Emirates Palace Marina and get a close look at one of the most spectacular hotels in the world. Then continue to watch the wonders of Abu Dhabi and its impressive 21st Century developments. Experience a touch of culture as you cruise along the heritage village site and tour the full length of the Corniche. Before heading back, pause at the timeless fisherman's village. Watch old wooden boats sail into the sea and see fishermen mending their nets against a backdrop of modern architecture. After you have taking some beautiful pictures it is time to go back to the marina. Click the link for a route map.